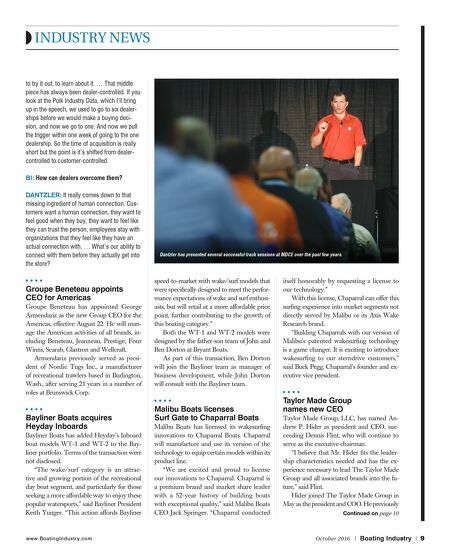 INDUSTRY NEWS www.BoatingIndustry.com October 2016 | Boating Industry | 9 to try it out, to learn about it. … That middle piece has always been dealer-controlled. If you look at the Polk Industry Data, which I'll bring up in the speech, we used to go to six dealer- ships before we would make a buying deci- sion, and now we go to one. And now we pull the trigger within one week of going to the one dealership. So the time of acquisition is really short but the point is it's shifted from dealer- controlled to customer-controlled. BI: How can dealers overcome them? DANTZLER: It really comes down to that missing ingredient of human connection. Cus- tomers want a human connection, they want to feel good when they buy, they want to feel like they can trust the person, employees stay with organizations that they feel like they have an actual connection with. … What's our ability to connect with them before they actually get into the store? Groupe Beneteau appoints CEO for Americas Groupe Beneteau has appointed George Armendariz as the new Group CEO for the Americas, effective August 22. He will man- age the American activities of all brands, in- cluding Beneteau, Jeanneau, Prestige, Four Winns, Scarab, Glastron and Wellcraft. Armendariz previously served as presi- dent of Nordic Tugs Inc., a manufacturer of recreational trawlers based in Burlington, Wash., after serving 21 years in a number of roles at Brunswick Corp. Bayliner Boats acquires Heyday Inboards Bayliner Boats has added Heyday's Inboard boat models WT-1 and WT-2 to the Bay- liner portfolio. Terms of the transaction were not disclosed. "The wake/surf category is an attrac- tive and growing portion of the recreational day boat segment, and particularly for those seeking a more affordable way to enjoy these popular watersports," said Bayliner President Keith Yunger. "This action affords Bayliner speed-to-market with wake/surf models that were specifi cally designed to meet the perfor- mance expectations of wake and surf enthusi- asts, but will retail at a more affordable price point, further contributing to the growth of this boating category." Both the WT-1 and WT-2 models were designed by the father-son team of John and Ben Dorton at Bryant Boats. As part of this transaction, Ben Dorton will join the Bayliner team as manager of business development, while John Dorton will consult with the Bayliner team. Malibu Boats licenses Surf Gate to Chaparral Boats Malibu Boats has licensed its wakesurfi ng innovations to Chaparral Boats. Chaparral will manufacture and use its version of the technology to equip certain models within its product line. "We are excited and proud to license our innovations to Chaparral. Chaparral is a premium brand and market share leader with a 52-year history of building boats with exceptional quality," said Malibu Boats CEO Jack Springer. "Chaparral conducted itself honorably by requesting a license to our technology." With this license, Chaparral can offer this surfi ng experience into market segments not directly served by Malibu or its Axis Wake Research brand. "Building Chaparrals with our version of Malibu's patented wakesurfi ng technology is a game changer. It is exciting to introduce wakesurfi ng to our sterndrive customers," said Buck Pegg, Chaparral's founder and ex- ecutive vice president. Taylor Made Group names new CEO Taylor Made Group, LLC, has named An- drew P. Hider as president and CEO, suc- ceeding Dennis Flint, who will continue to serve as the executive chairman. "I believe that Mr. Hider fi ts the leader- ship characteristics needed and has the ex- perience necessary to lead The Taylor Made Group and all associated brands into the fu- ture," said Flint. Hider joined The Taylor Made Group in May as the president and COO. 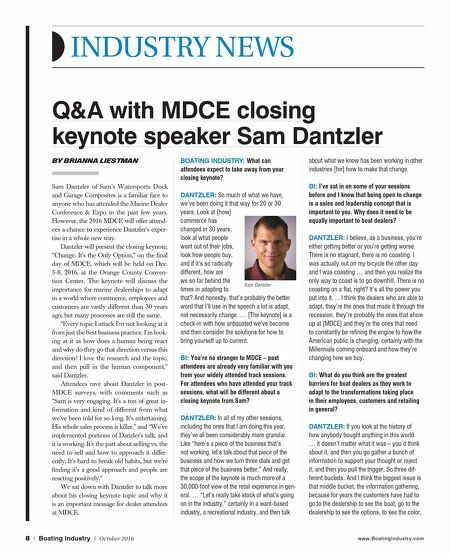 He previously Continued on page 10 Dantzler has presented several successful track sessions at MDCE over the past few years.